But there are still dangers out there. Diseases like measles and whooping cough can spread really fast and cause serious harm. The good news is you can prevent them and many other diseases by getting vaccinated. Educating yourself about vaccines and getting your shots will protect you and your loved ones. You’ll also help the health of your community. Vaccines are safe: Vaccines are studied and constantly monitored by scientists to make sure they’re safe. 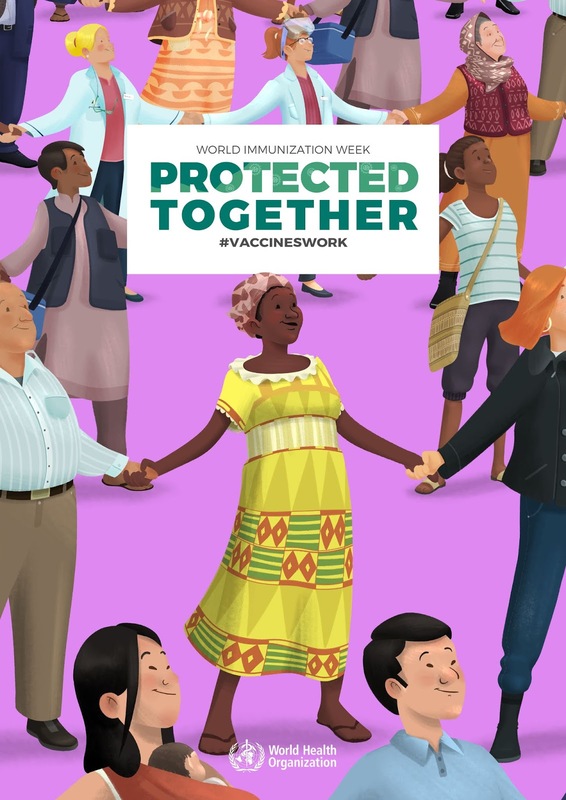 Vaccines protect: If enough healthy people are vaccinated, we can protect babies, seniors and sick people who can’t be vaccinated. Vaccines save money: Getting a vaccine is much less costly than being treated for a disease. Vaccines save lives: The diseases vaccines are made for can be deadly or really serious if not treated. Vaccines don’t cause autism: There’s no link between vaccines and autism. Science has disproven this again and again. Still have questions? Talk to your trusted health care providers. They’ll be able to share information with you and address any concerns. Do your part to stop the spread of diseases. Celebrate World Immunization Week by reminding your family and friends that vaccines work and save lives. That way, we can all be protected together. April showers bring May flowers — and floods. From drizzling to pouring, plenty of rain has come our way this spring. In the case of the Midwest, that has led to devastating flooding. 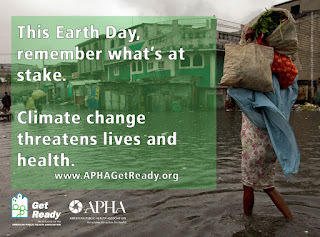 Earth Day is April 22, which is a good reminder that climate change is bringing more extreme weather, including severe floods. Floods are scary and dangerous. This spring, floods have killed at least four people and destroyed 2,000 homes. And rainy season isn’t over yet. Hundreds of millions of Americans are still at risk for above-average flooding through May. With that in mind, now is a great time to prepare for floods, which can happen anywhere and anytime. Learn what evacuation plans your community has for floods. Check out shelter locations and emergency alert systems. Put together an emergency preparedness stockpile. Get flood insurance, especially if you live in a high-risk area. Turn off the electricity, gas and water when evacuating. 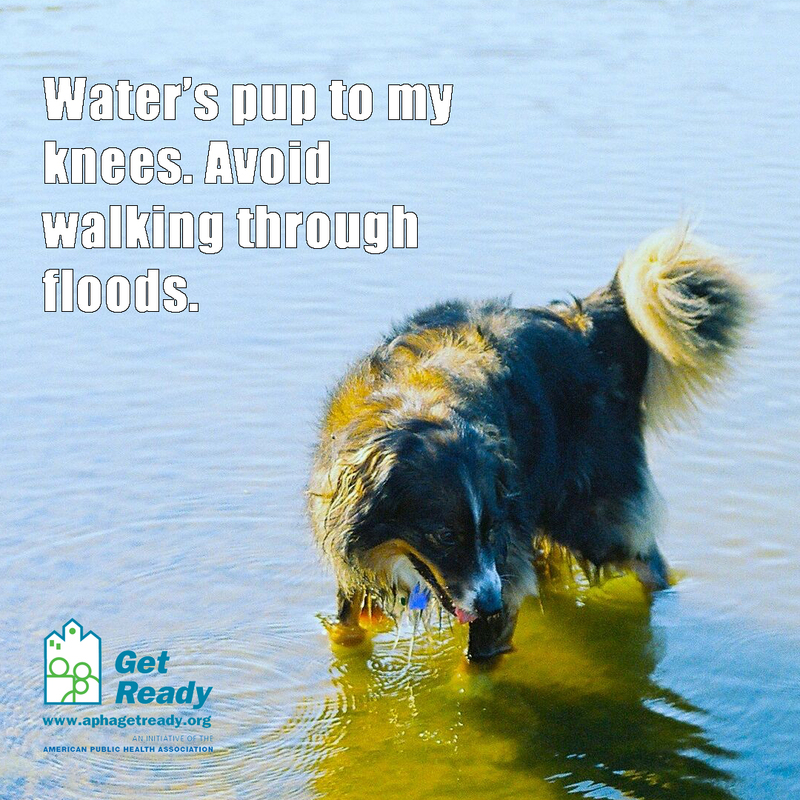 Never walk, swim or drive through floodwaters. Sanitize your sinks and bathtubs with bleach and fill them with water so you have a clean water source. Listen to authorities for instructions and information, such as whether it is safe to return to a flooded area. Wear gloves and wash your hands often when cleaning up. Be alert for electrical equipment and other dangers in the water. Start an insurance claim and get help if you have damage. For more tips, check out our Get Ready flood fact sheet. You can also act on climate year-round. Small, everyday changes can make a big difference! Join the conversation by using the hashtag #ClimateChangesHealth on social media. If a hurricane, tornado or spring snowstorm hit your area today, how well would your community be able to recover? Being able to bounce back quickly and in a healthy way after something bad happens is known as resilience. It’s something U.S. communities are working toward, especially as weather disasters have gotten worse in recent years. Communities are resilient when they prepare and plan for emergencies. A resilient community is also one that can recover and adapt after a disaster. That’s something we all want in our communities, right? In March, the National Academies of Sciences, Engineering and Medicine released a new report that can help community leaders find out how well they’re doing at building resilience. Planners should take all parts of a community into account, including social, economic and natural structures. Are there areas of your community that are isolated, poorer or where people are less connected? What would happen to people there during a disaster? Communities should collect data that can help them make decisions about resiliency. That way they can make decisions at budget planning time and share successes with residents. If your community has a preparedness office or official, you may want to drop them a line and make sure they’ve seen the report. Tell them you want your community to be resilient and offer to help. You can make yourself more resilient in case of an emergency too. For starters, learn what disasters your community is most at risk for. 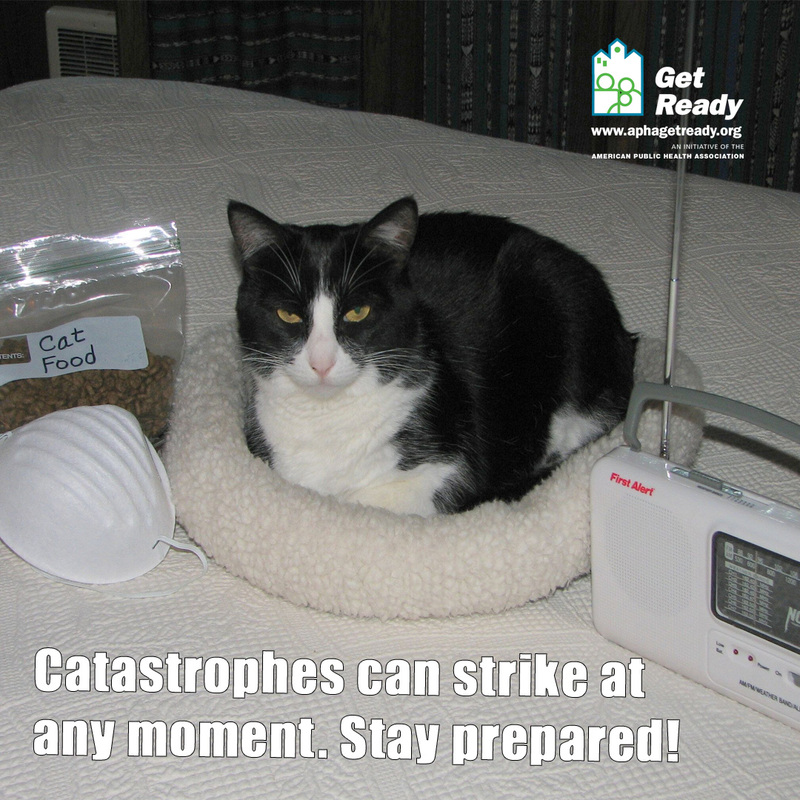 Our Get Ready fact sheets can also help you prepare. You can share them with friends, family and community leaders. But don’t wait for a disaster to strike. Help yourself and your community become more resilient today! 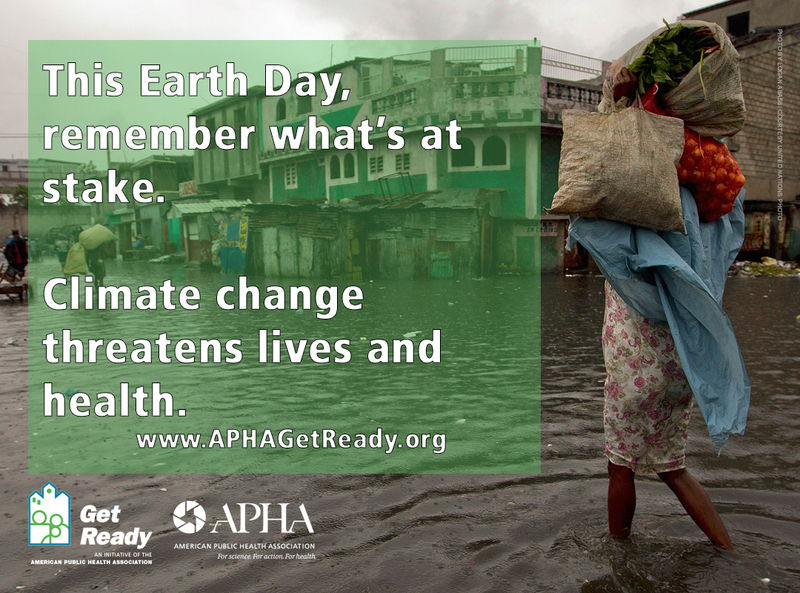 Public health and preparedness are critical for everyone. But sometimes people forget just how important they are. For one week in April, we have an opportunity to raise awareness about them both. National Public Health Week, an annual observance led by APHA, is being celebrated April 1-7. While the week’s focus is on overall public health, it’s also the perfect opportunity to share information on getting ready for disasters. When you’re hosting your NPHW events, look for ways to bring preparedness into the conversation. Each day of NPHW has its own theme, which gives you lots of possibilities. Monday is healthy communities, Tuesday is violence prevention,Wednesday is rural health, Thursday is technology and public health and Friday is climate change. Saturday and Sunday are both focused on global health, which ties in nicely to World Health Day on April 7. Organize a community food drive using our toolkit to support your local food bank. Hold a town hall and share information on disasters in your community and include evacuation routes and local shelter locations. Set up a table at your local grocery store and hand out emergency stockpile shopping lists. Having a health fair? Share some of our Get Ready fact sheets and play some of our Get Ready games with kids. 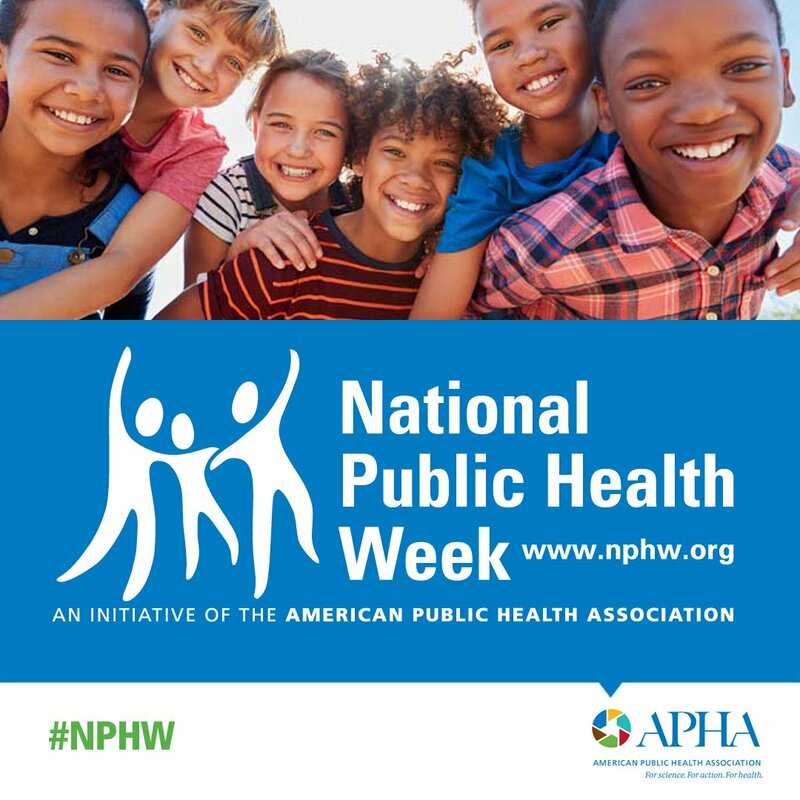 Add your events to the NPHW calendar. Want to see your photos on the NPHW site? Tag your Instagram posts with #NPHW. Be sure to tune into our live NPHW Forum on April 1, Twitter chat on April 3 and career panel webcast on April 4. Here’s to a happy, healthy and prepared National Public Health Week! Today’s guest blog post is by Chrystal Okonta, who is with the Department of Food Safety Education at the U.S. Department of Agriculture’s Food Safety and Inspection Service. This week, we say hello to spring and goodbye to winter! Many of us have begun tucking away our winter gear. But unlike heavy coats, you cannot put away your emergency preparedness tips. While snowstorms have passed, we have welcomed March winds and April showers. Every season can cause a disaster. A rainy day could turn into a flood. Heavy wind could blow out your power. Without electricity, your fridge and freezer food could spoil. Lights out can be scary when you don’t know how to keep your food safe. Never fear! You can take steps to avoid food spoilage and reduce foodborne illness. Follow these tips before, during and after a storm or power outage. Check your temperatures: Put appliance thermometers in your fridge and freezer. Set your refrigerator to 40 degrees or colder. Your freezer should be 0 degrees or below. If the power goes out, you’ll know if your food is at the right temperature. 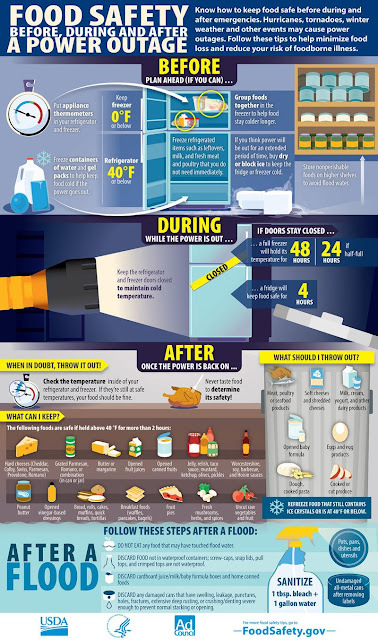 Empty your fridge and stock your freezer: During a power outage, the freezer keeps food safe much longer than the fridge. You can put almost anything in the freezer — meat and poultry, dairy, even leftovers! Make ice in advance: Ice keeps food colder longer. Stock your freezer with containers filled with water, ice trays or ice packs. Also, know where you can buy extra ice if yours starts to melt. Stock up on nonperishable items: When you don’t have power, nonperishable foods can get you through the storm. There are even recipes that don’t need power! Make sure to store your items in a cool, dry place. Keep them above any potential flooding levels. Check those temperatures — again! Your refrigerator will only keep food safe under 40 degrees for about four hours without power. But a fully stocked freezer stays cold without power for about 48 hours. A half-full freezer is safe for about a day. Keep the doors shut as much as possible. Don’t store perishable food outside: Even if it’s cold out, don’t store your food in the car, garage or basement. Instead, keep your fridge and freezer doors closed. You can also use coolers filled with ice to keep your foods below 40 degrees. Once the power turns back on, check your food. Use this chart to decide which foods to keep or toss. Refrigerated foods: Your fridge foods are safe if they have stayed below 40 degrees. Good news: Butter, cheeses, canned fruits, juices, bread products, uncut fresh fruits and vegetables are safe even if the fridge gets too warm. But meats and other dairy above 40 degrees can get you sick. Make sure you throw them out. Freezer foods: Food with ice crystals or that has stayed below 40 degrees can be refrozen. Partially thawed ice cream or frozen yogurt cannot. Throw out unsafe dairy products to avoid getting sick. Nonperishable foods: Don’t eat foods that touch floodwaters. Never eat food boxed in cardboard if it got wet. Canned goods are safe even in flooding if they are not damaged. Throw away cans that are leaking or damaged. Use bleach to sanitize cans that touch floodwaters. Mix one tablespoon of unscented bleach with a gallon of water. Take off the can labels and rinse your cans with the bleach solution. Once they dry, these canned foods are safe to eat. For more tips from food safety experts, call the USDA Meat & Poultry Hotline at 1-888-674-6854. Information is available Monday through Friday from 10 a.m. to 6 p.m. Eastern Time. You can also email or chat via Ask Karen in English or Pregúntele a Karen en Español. You, too, can stay food safe during severe weather and power outages! By Debora Cartagena, courtesy CDC. Trying new, trendy foods can be fun. They can even be more healthy than the things you eat every day. But when it comes to raw milk, public health officials warn you could be putting your health and life at risk. Some people think raw milk is better for them, but they’re wrong. Raw milk is dangerous. The problem is that raw milk isn’t pasteurized. During pasteurization, milk is heated to a high temperature, killing off disease-carrying germs. When milk isn’t pasteurized, germs don’t die. And then you can get sick. Over a 19-year period, there were almost 130 diseases outbreaks linked to raw milk in the U.S. In February, the Centers for Disease Control and Prevention said it was looking into cases of Brucellosis in people who consumed raw milk from a farm in Pennsylvania. Caused by the bacteria Brucella, the infectious disease comes from animals and can make people very sick. Other nasty things that can be swimming around in your glass of raw milk include E. coli and Listeria. The germs can get into milk through animal feces, rodents and dirty equipment. Anyone can get sick from raw milk and its products, such as raw ice cream or raw cheese. The risk is highest for young children, seniors and people with weak immune systems. But CDC says that healthy people of any age can get very sick and die from contaminated raw milk. So now you know: Raw milk is gross and unsafe. What can you do to avoid it? Look for milk products that are labeled “pasteurized” to make sure they’re safe. Don’t assume that because milk is labeled organic that it’s OK. It still needs to be pasteurized. 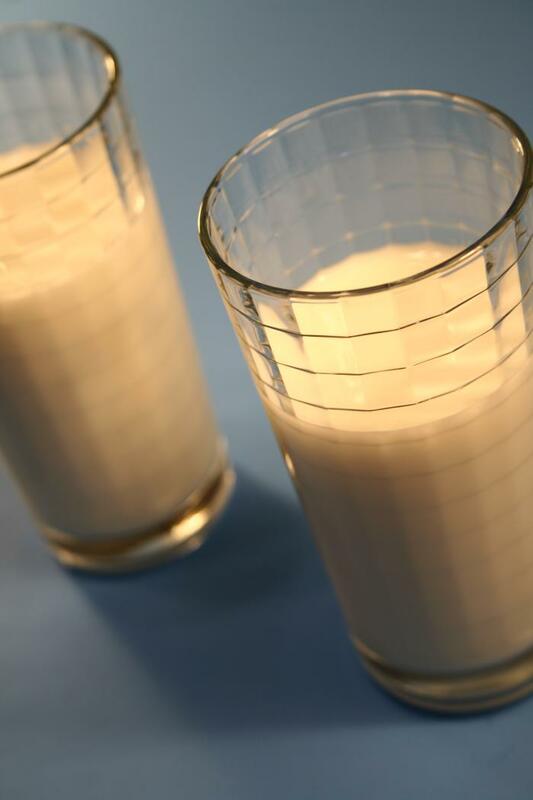 If you’re not sure a milk product is pasteurized, don’t eat or drink it. Once you bring your dairy products home, keep them refrigerated at 40 degrees or below. And be sure to toss any expired products. For more FAQs on raw milk, visit CDC’s website. Attention: It’s almost time to set your clocks and check your stocks! This Sunday, March 10, we lose an hour of time. But what we shouldn’t lose is our sense of feeling prepared. You can be ready when emergencies happen by keeping a stockpile. When you set your clock — or it automatically resets — for daylight saving time, use it as a reminder to check your emergency supplies. That way, you won’t be missing important items when you really need them. First, check that you have what you need. 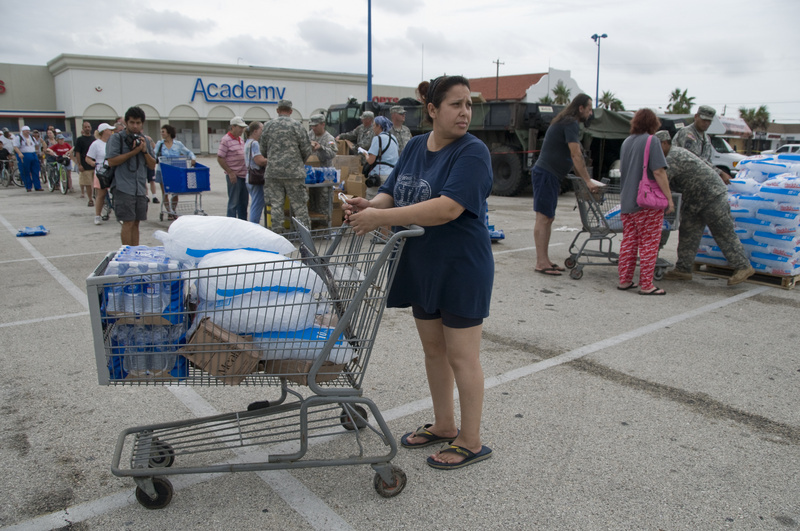 You’ll need a three-day supply of water and nonperishable food. Include supplies like a manual can opener, first-aid kit and flashlight. Don’t forget about pet supplies too. For a full list of emergency supplies, look at our checklist. Second, replenish supplies that are out of date or missing. We’re all guilty of “borrowing” supplies from our stockpile. So make sure you replace anything you took out. If your food is going to expire soon, use it. Then, put in new nonperishable items. Toss the supplies that are already expired or damaged. Don’t forget to replace them! Third, store supplies in an easily accessible container. Store everything in one spot that you can get to easily. Make sure it’s a cool, dry place. You can also store supplies outside the home. Keep a go-bag at work, school and in your car. Remember to check your go-bag when you set your clock as well! Get more tips and resources to share in your community. It’s easy to feel overwhelmed these days. You might even feel it’s hard to find time to prepare for emergencies. Luckily, APHA’s Get Ready campaign is here to help you stress less. We have two new infographics with five fast facts that everyone can use to get prepared. 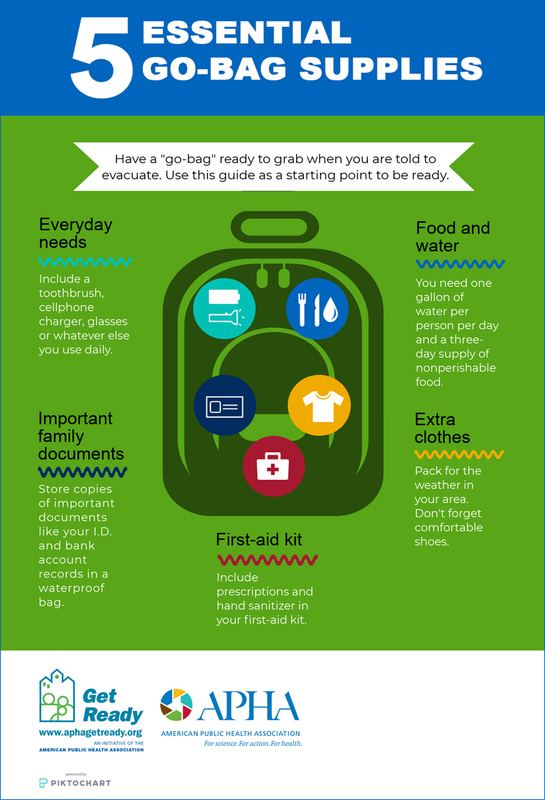 Our new infographic on “go-bags” will help you get ready to go quickly during an emergency. You’ll learn five essential types of supplies you need in every go-bag. The infographic is quick and easy to follow. If you’re wondering why you need a go-bag or want more supplies, our go-bag fact sheet can fill you in. Measles has been in the news lately, and for good reason — it’s dangerous. It’s really important to get vaccinated and protect yourself, your family and community from this highly contagious disease. Our new measles prevention infographic can help you share that message. Get Ready infographics are perfect for sharing at the office, at school, in the community or at home. Check out our full lineup. There’s even space at the bottom to add your logo! Winter 2019 has been record-breaking. Remember that deadly polar vortex that froze much of the Midwest in January? Chicago felt a wind chill of 51 degrees below zero. Brrr! There’s almost a month of winter still left. This week’s storm that blanketed the mid-Atlantic with snow and ice and shut down the federal government in the Washington, D.C., area was a timely reminder that winter isn’t over. As temperatures drop, be aware that winter chills can bring cold weather injuries and emergencies. One risk is frostbite. It can occur when you are exposed to extreme cold. It causes your body tissues to become frozen, and can even damage your muscles and bones. The first signs of frostbite are redness, pain and numbness. If you recognize the symptoms, seek medical care. Go to a warm room. Remove wet clothes and soak in warm water. Do not walk on frostbitten toes or rub your skin. You can cause more damage! You might also be at risk of hypothermia if you spend a long time in very cold weather. It happens when your body loses more heat than it can produce and leads to a lower body temperature. Symptoms are shivering, confusion, memory loss and slurred speech. Take your temperature if you notice signs of hypothermia. If it’s below 95 degrees, get emergency medical attention right away. If medical help isn’t available, follow the same steps for frostbite. Start by warming the center of the body — chest, groin, neck and head. Warm, non-alcoholic beverages can help increase body temperature. You can take steps to prevent cold-related injuries by dressing the right way for the weather. Cover your skin, including your face, hands, ears and neck. Wearing layers, gloves, a hat and sturdy boots will help keep you warm. Be a good neighbor and help others get ready. People who are homeless are most in danger of cold-related injuries. You can help by donating warm blankets, clothes and other emergency supplies to your local shelter. Don’t let arctic winds freeze you in your steps and keep you from being prepared. Stay warm and safe! Love is in the air! Share the love instead of germs this season with our Get Ready Valentine’s Day graphics. From llamas and donuts to Ariana Grande and Drake, our new valentines will make you smile. Print them out and share with your friends and family. You can also take them to school or the office for everyone to enjoy. Don’t forget to share our GIFs and graphics on social media. Tag us on Twitter, Facebook, and Instagram if you want us to be your preparedness pal this Valentine’s Day. ¡El amor está en el aire! Comparte el amor en lugar de los gérmenes con nuestras tarjetas de San Valentín. Desde llamas y donas hasta Ariana Grande y Drake, nuestras tarjetas de San Valentín te harán sonreír. Imprímelos y compártelos con tus amigos y familiares. También puedes llevarlos a la escuela para que todos disfruten. No olvide compartir nuestros GIF e imágenes en las redes sociales. Etiquétanos en Twitter, Facebook e Instagram si quieres que seamos tu amigo de preparación este día de San Valentín. Measles is making a comeback. Let’s stop it in its tracks. By Jim Goodson, M.P.H., courtesy CDC. Once upon a time, in the year 2000, measles was eliminated in the U.S. Before the measles vaccine, the disease infected 3 million to 4 million Americans each year. As many as 500 died and 48,000 were hospitalized annually. Those numbers have dropped dramatically, but that doesn’t mean measles has gone away. In recent years, there have been a few big surges, including more than 660 cases in 2014 and 370 last year. This year has seen almost 80 cases already. Part of that is because of a measles outbreak in Washington. About 50 cases have been diagnosed as of this week, mostly in young kids. Measles is super contagious. It’s so contagious that if one person has it, 90 percent of people who are not immune to it will get sick too. Symptoms of measles appear seven to 14 days after becoming infected. 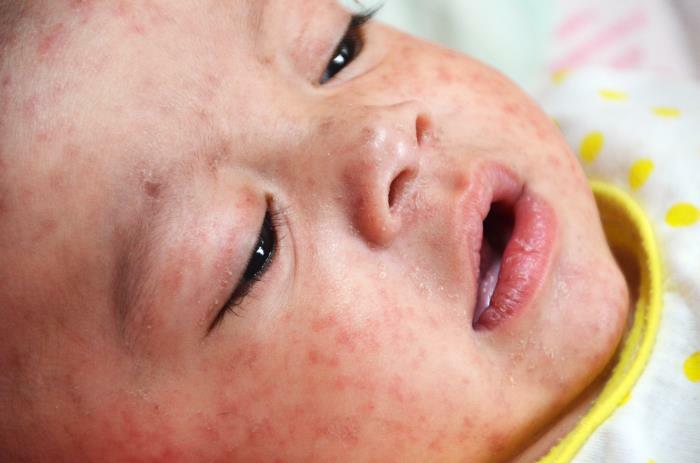 Measles’ first symptoms are high fever, cough, runny nose and water eyes. Two to three days after symptoms first appear, tiny white spots may appear in your mouth. After three days, a rash breaks out on your skin, spreading from your head to your feet. Measles spread by sneezing or coughing. You can avoid measles by getting vaccinated. The two-dose shot protects you from measles, mumps and rubella. You can also get a version of the shot that protects against chickenpox. So if we have a vaccine and it works so well, what’s going on? The problem is that some people are refusing to vaccinate their kids, often because they are scared. There is no reason to be scared. Data are really clear that MMR protects far more than it harms kids. In the Washington outbreak, health officials have confirmed that most of the kids were not vaccinated. Sadly, vaccination coverage has fallen nationally to about 92 percent for MMR. The World Health Organization has identified vaccine hesitancy as one of the biggest threats to global health this year. Globally, measles has seen a 30 percent increase, in part because of people who have been skipping vaccinations. The good news is you can prevent the spread of measles. Get the MMR shot. Also, wash your hands often. Avoid touching your face, eyes, nose and mouth. Try to avoid close contact with people who are sick. And if you’re sick, don’t go to work or school. Find out more about the importance of vaccinating kids with our Get Ready fact sheet. February's around the corner! Every time February comes around, people are reminded of all things love. But it’s more than just candy hearts. You can focus on heart health, too. February is American Heart Month. Heart disease is the No. 1 cause of death for men and women in the U.S. Almost 1 in 4 Americans die every year of heart disease. Nobody wants heart disease. But it’s something we all need to prepare for if a heart emergency strikes. Heart disease, also known as cardiovascular disease, refers to many conditions. It happens when fatty plaque clogs your blood vessels. You can reduce your risk of heart disease by not smoking, eating healthy food, exercising and watching your weight. Fatty plaque makes it hard for blood to flow. It can also lead to a blood clot. A heart attack happens when a clot cuts off the flow of blood and oxygen to your heart. 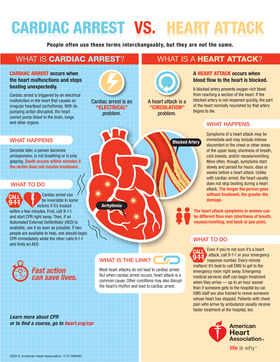 Cardiac arrest is not the same as a heart attack. Cardiac arrest is when your heart stops beating. The American Heart Association says early signs of a heart attack include chest and upper body pains. Some people also get shortness of breath. Men and women can have different symptoms. Sudden cardiac arrest can happen without warning. Symptoms are sudden collapse, no pulse and no breathing. Know the signs for both. Call 911 if you or someone near you is having a heart attack. The person having the heart attack should chew an aspirin. If that person is unconscious, a 911 operator might tell you to start CPR. You can get CPR training at a location near you. In case of cardiac arrest, call 911. Grab an automated external defibrillator, if available, and use it! But don’t use an AED on someone who is conscious. Do CPR until an ambulance arrives. Doing CPR to the beat of ‘70s hit song “Stayin’ Alive” more than doubles a person’s chance of survival. Heart attacks are life-changing. Make sure you’re prepared to save a life. Have a happy, heart healthy February! Losing a job or missing a paycheck can be scary. Unfortunately, a lot of workers around the country have been finding out what that’s like lately. More than 800,000 federal workers aren’t getting paid during a partial shutdown of the federal government that began Dec. 22. That’s created a lot of worry for them and their families. Two-thirds of these workers say they don’t have enough savings to cover a month without their salaries. They aren’t alone. Living paycheck to paycheck is common for many Americans. Demand is up at food banks, which are working to help federal workers and contractors. Some organizations are offering supplies for pet owners as well. Sadly, losing a paycheck and struggling to make ends meet can happen to anyone. It’s one of those things no one wants, but can try to prepare for when times are good. When you’re getting a regular paycheck again, take time to stock up on food and emergency supplies. Get Ready has a grocery list and an emergency stockpiling list you can follow. Keeping your kitchen cabinets safely stocked means storing at least a three-day supply of food and water. And don’t forget supplies for your furry and feathered friends. You can use these lists to prepare for a paycheck disaster or any other emergency. While all this shopping can seem overwhelming, it doesn’t have to be done all at once. And there are lots of ways to stockpile on a budget, as our Get Ready fact sheet shows. If you’re one of the lucky ones who is getting paid right now, you can help out by donating to your local food bank. If you have time to hold a food drive, our Get Ready toolkit will help you plan, promote and successfully complete it. Even if those food donations don’t go to federal workers, they will help out others and your community will be more prepared for emergencies of all kinds. APHA is calling on Congress to protect public health and end the shutdown. Send a message to your legislators and urge them to work with colleagues to end the impasse.